Score the gold look and get into red carpet mode even if you are just stepping out for work or a few errands. If the ho hum weathers and the rain laden clouds above are stopping you from going the diva way, do not fret – we have a way out. But, first a little bit of history on gold before you actually think of going for gold! The Aztecs were the true lovers of gold and they pretty much forged the history of plundering and conquering for treasure. Craftsmen and elite society members usually wore the traditional Aztec jewellery, and their love for gold was such that in the 1500s, they even built a complex of underground caves and tunnels to hide the gold that the rest of the world now wanted. Yet, the Spaniards decided to descend on their territory for some good old loot – and that is how they came to seize the Valley of Mexico! So, going for gold usually shows a love for all things glitteringly beautiful. Gold has been known as the metal of choice in the heyday when families wanted to show their social status. Even now everyone from little girls to grown women are known to be going for gold! Here are a few tips on bringing gold into your look this season! The look of gold by StyleAura for The White Muslin! 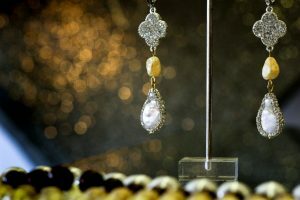 If you are going for gold, you do not necessarily have to opt for a hunk of the precious metal. You can infuse some muted gold finesse with this rough cut bead that dangles between two finely crafted pieces to form a pair of earrings. The gems used here are also known for their healing properties. The combination of the rock like hunk in a golden hue and the glittering gems that are crafted in a fine manner, is too good to resist and one that you can pair with sarees and formals alike! If this is not the perfect Greco Roman piece, then we do not know what is! 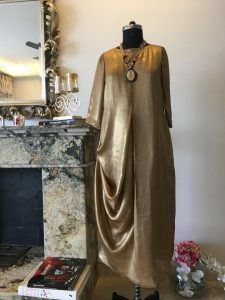 This asymmetrical kurta from designer Aekta Dhingra’s line with its lounge like look is perfect for a royal evening spent at home or with friends! Let the ghazals play in the background, while you settle down for a genteel evening. Paired with a Victorian pendant style necklace, the beauty of this piece is the muted golden hue that makes for understated elegance. If you truly are looking for a royal look, then why not go all the way! 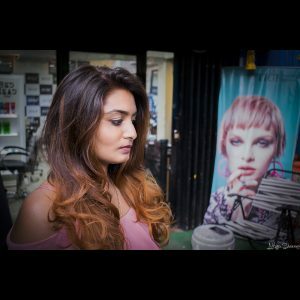 These coppery highlights by stylist Abhishek for Zulf are perfect to show off those lazy waves. Get this look to bring out the shine of your gold ensemble and accessories in the perfect way!